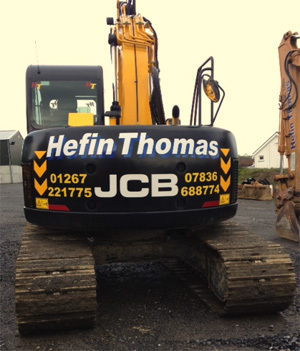 To Hefin Thomas Plant Hire, Plant Leasing and Tarmac services in Pembrokeshire, Cardiganshire, Carmarthenshire, and down to Swansea. Long or short term Plant hire of diggers and mini diggers, excavator hire and JCB's, Rock hammers and now offering a range of Tarmac services for roads, driveways, car parks, playgrounds and more. So, if you need to hire a digger for the day or longer, or enquire about our tarmac laying services or tarmac contracting services then take a look around our site and then contact us. We pride ourselves in our high level of customer care and reliability of our machines. We have an extensive range of specialist plant hire equipment to assist our customers to get the job done.